We named our 2008 Hobonichi belly warmer summer collection "Leisure Time Haramaki". Wrap yourself with love, warm up your cold body in air-conditioned environments and keep life comfy and easy. all pricetaxincl.,shipping handling fee excl. 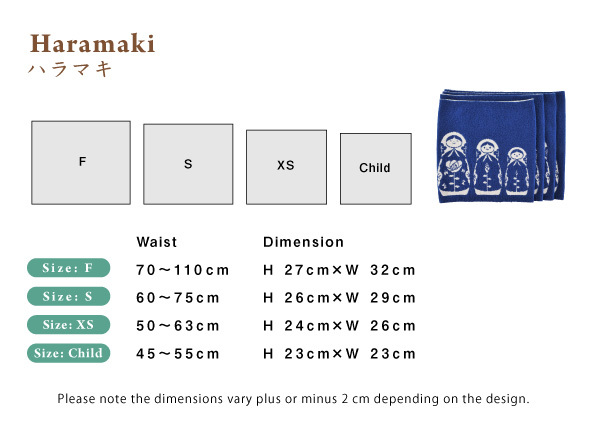 Haramaki or "belly warmers" can keep you cosy all through the year. 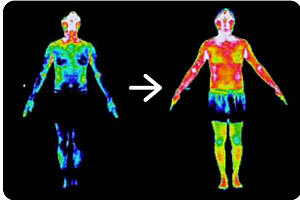 Not only on cold winter days - even in summer when air-conditioning messes with our body heat balance. With just one Haramaki wrapped around your waist it keeps your body warm where you need it most. *Male age 25, data taken in an air-conditioned room set to 25°C. Data may vary according to individuals. A common Haramaki is nothing but a functional piece of clothing that is usually hidden under clothes and considered slightly embarrassing. The concept of the Hobonichi Haramaki is entirely different. We want you to show off with a precious design accessory that complements your outfit - and your health. Feel free to combine it in any way you like - from having it stick out underneath your shirt to fully exposing it on top - like an Obi around your waist. One of the reasons why Haramaki fans love our product is because our "belly warmers" wrap so nicely around your waist. In cooperation with the knit factory, we constantly aim for maximum comfort. Hobonichi Haramaki was featured in the Tokyo-based online magazine about "Design and Making things." Next collection will be available this fall - winter!